Welcome to FROGS ARE GREEN, an organization created to increase awareness about the catastrophic decline of frog and other amphibian populations and to advocate for conservation measures to help protect them. Why frogs and not some other animal or cause? Frogs and other amphibians are disappearing at an alarming rate. 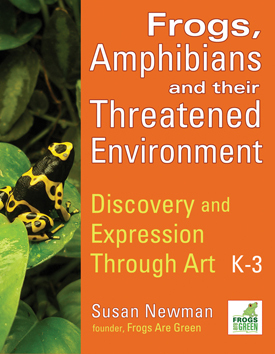 One third of all amphibian species around the globe are threatened with extinction. Frogs are extremely sensitive to environmental threats such as acid rain and global warming. They are also threatened by invasive species and habitat loss. Frogs, toads, and other amphibians (salamanders, newts, and caecilians) serve many vital functions in the ecosystems in which they live. Their disappearance is happening so fast and at such an enormous scale that it has been compared to the extinction of the dinosaurs. And yet most people are unaware of the crisis. In her speeches, Wangari Maathai, an African environmentalist who was awarded the Nobel Peace Prize in 2004, often uses the disappearance of frogs as a metaphor for an unhealthy environment. Maathai remembers as a child drinking clean and pure water from the stream near her home. She played among arrowroot leaves and was fascinated by the tadpoles wriggling through the clear water. This was the world she inherited from her parents. Frogs Are Green is determined to preserve for future generations the outdoor music—the chorus of frog song—that we remember from our childhoods. Our hope is that can we leave the “home of the tadpoles” green and healthy for future generations. Please help spread the message that healthy frogs equal a healthy green planet. Support green web hosts like iPage and you are supporting the environment! See reviews of iPage here. I’d like to thank Mary Jo Rhodes for participating in this cause from May 2009 through March 2013. She has moved on to other endeavors. Special thanks to Home Security List for their support!